Ending child marriage will help break the intergenerational cycle of poverty by allowing girls and women to participate more fully in society. Empowered and educated girls are better able to nourish and care for their children, leading to healthier, smaller families. When girls are allowed to be girls, everybody wins. 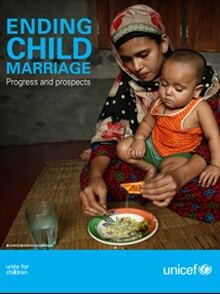 This brochure explores the data and statistics behind those stories: the current situation of child marriage, lifelong – sometimes intergenerational – consequences, progress to date and prospects.